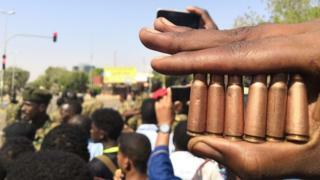 Protests in Sudan, demanding President Omar al-Bashir and his government stand down, have taken a twist with the activists being helped by some soldiers. army headquarters. The BBC has been talking to some of the demonstrators. I am at the sit-in at the army headquarters now – on the street opposite the naval force headquarters. We spent the night here. At around 04:00 we were attacked by the national security forces. Tear gas and live bullets were fired. As soon as we started hearing the bullets the army let us into the headquarters and then fighting broke out. The national army are protecting us. They let us into their HQ building and they are firing back at the NISS [National Intelligence and Security Service] soldiers. It is serious now. This is the second night they [the NISS and the army] have been firing at each other. It is pointless for [President] Omar al-Bashir to continue using his thugs to get us off the streets as we are not going anywhere. I’m hoping he will give up. Ahmed Mahmoud was talking to BBC Newsday on Tuesday 9 April. Who is President Omar al-Bashir? I don’t want to disclose where I am, for my own safety. People from the army started helping protesters because the government militias were using tear gas and live ammunition against peaceful protesters. Not everyone in the army supports us – it depends on their rank. The highest ranks are supporting the regime while other ranks joined the protesters. The protesters haven’t left the army headquarters since 6 April when more than 800,000 people gathered there. Many spent the night there and on Sunday more people came, increasing to number of protesters to almost two million. Some people brought mattresses and pillows. The protesters also created a small clinic where you can buy medication and see a doctor. Sudanese people are collecting money for the protesters to buy food, water, shelter, sound systems and even generators. You can feel the unity and solidarity. This is the biggest protest against the government in the history of Sudan – bear in mind that in 1964, and in 1985 we overthrew two governments through revolutions. The government doesn’t care about Sudanese people getting killed. What they care about is staying in power. That’s why I’m afraid it’s going to become a conflict between the good people from the military and the other militias. Walaa was speaking to BBC Focus on Africa radio on Monday 8 April. I have been protesting outside the army headquarters since Saturday. The sit-ins are filled with positive energy, community and incredible kindness. Inside the sit-in there is music, performances and harmonised chanting. Lots of food and drink has been sent in by other people and private companies to help endure the long hours and heat. The types of people participating are so diverse – a mix of ages, religions, classes, ethnicities and gender. Being in there, none of us feel alone in this cause. People are peaceful, helpful and protective of one another. This sit-in shows a lot of who we are as a nation – our resilience, courage, solidarity, community and commitment to change for our country. The past four days have instilled in us a strong sense of hope for a future that we can finally look forward to. The bullets have not deterred the numbers – on the contrary they are creating more resolve. The past four days are a culmination of years of resistance. To see all the years of effort reaching this point is liberating. Dalia El Roubi was speaking to the BBC News website on Tuesday 9 April.